Dress rehearsals will be conducted on Saturday, April 13th at Chelsea High School. 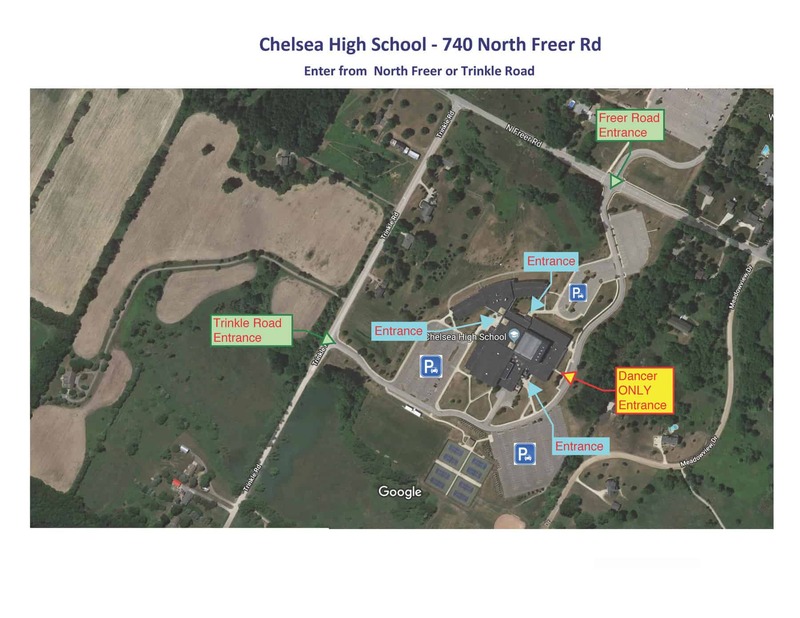 Click HERE for a map of the school, including parking areas and the appropriate entrances. Rehearsals for the 1:30 PM show will run from 9:00 AM to 12:00 PM. Rehearsals for the 4:30 PM show will run from 1:00 – 4:00 PM. Dress rehearsal is MANDATORY and dancers are expected to arrive and be checked in at the ‘call time’ which can be found on the Parent Portal (click on the ‘Shared Files’ icon and then the ‘Class’ tab). A parent or guardian of each dancer under the age of 11 is required to stay with their dancer during dress rehearsal. Parents may share this responsibility, but each dancer must have a responsible adult present as supervision for young dancers is not provided during dress rehearsals. Dancers and parents should report directly to the auditorium after check-in and remain there until it is time for their class to rehearse. Each class will be escorted to the ‘photo room’ for a class photo after their rehearsal is complete. If dancers are in multiple classes, they must not miss a rehearsal to have their picture taken. All other classes will participate in the finale scene and must stay until the end of their scheduled rehearsal time (Noon for the 1:30 pm show and 4:00 pm for the 4:30 pm show). Dancers participating in finale should remain quietly in the auditorium. No talking above a whisper! We are on a very tight time schedule and dancers need to hear their instructor and be free from distraction. Photography and videography are allowed, but only without flash. Note: photography and videography are NOT permitted during recital performances. Parents or siblings who violate the above will be asked to leave the theatre.